Part sculpture, part functional dish, this bowl is Richard Glass's version of an abstract seascape. Inspired by the ocean's swirling, tumbling waves, Richard Glass designed this beautiful bowl. He handcrafts the "version of an abstract seascape" from layers of clear crystal and colored powder. As they heat up in the kiln, the materials twist and fold to create organic, ocean-like swirls and patterns. Once it cools, the piece is sandblasted, giving it a unique frosted finish that feels analogous to mist rising up from the sea. 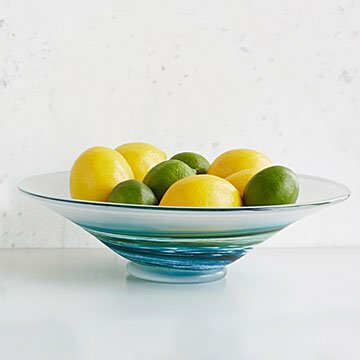 Whether you use it to serve your favorite dish or keep it displayed as a work of art, it gives your home a touch of deep blue elegance. Handmade in Devon, England. 13" diameter x 3.75" H; 5.5 lbs. Hand wash only. Not ideal for holding hot contents.